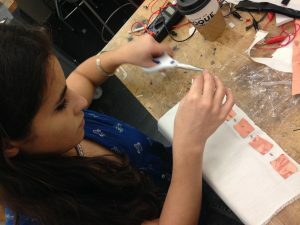 DIY touch sensors made with conductive copper fabric and Velostat. 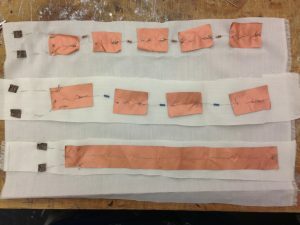 The addition of resistors between every piece of conductive fabric simulate the concept of a distance sensor. 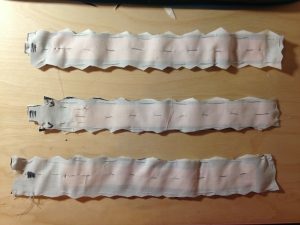 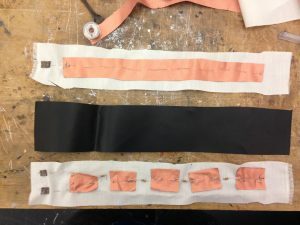 This entry was posted in Week 3: Switches, Sensors, Swatches and tagged computational craft, conductive, copper fabric, distance sensor, DIY, fabric, physical computing, resistor, swatches, touch sensor, velostat, wearable tech on December 27, 2016 by arons206.